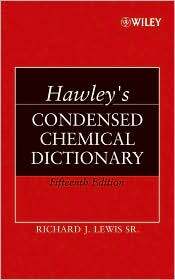 Hawley’s Condensed Chemical Dictionary, 15th Edition is a compilation of technical data and descriptive information covering thousands of chemicals and chemical phenomena, trade name products, processes, reactions, products, and related terminology. What is a chemical compound? Compounds are substances that are two or more elements combined together chemically in a standard proportion by weight. Compounds are all around us – they include familiar things, such as water, and more esoteric substances, such as triuranium octaoxide, the most commonly occurring natural source for uranium. This reference guide gives us a tour of 100 of the most important, common, unusual, and intriguing compounds known to science. Each entry gives an extensive explanation of the composition, molecular formula, and chemical properties of the compound. In addition, each entry reviews the relevant chemistry, history, and uses of the compound, with discussions of the origin of the compound’s name, the discovery or first synthesis of the compound, production statistics, and uses of the compound. -A bitter priority dispute among several doctors over the discovery of ether as an anesthetic lead to suicide, prison, and early deaths. The reference guide includes a glossary, a guide to further reading, and numerous chemical illustrations to help illuminate the text. Updates and expands the coverage from the previous edition. Adds entries for notable chemists and Nobel Prize winners, equipment and devices, natural forms and minerals, named reactions, and chemical processes. 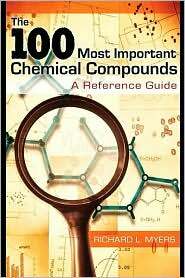 Provides concise, condensed, and prompt definitions of terms and phenomena in chemistry, biology, biochemistry, and more. Is ideal for those with only minutes to devote to any given chemical substance or topic.